Aconcagua is not currently on our schedule as a full expedition. Aconcagua is the highest peak in South America, at 6959m. This expedition to the mountain will climb by the quieter eastern side, joining the normal route high on the mountain. On this side of the mountain the trek to base camp takes three days, allowing some good acclimatisation time. From the Plaza Argentina base camp at 4200m the eastern route on Aconcagua involves a couple of hard days up over scree to a high camp at the foot of the Polish Glacier at 5900m. From here the normal route is joined, leading over scree and snowfields to the summit. With our very small group size and low guide ratio ensuring personal attention throughout the trip, this expedition is equivalent to the "highly supported" Aconcagua trips offered by other companies. This ascent is suitable for anyone with several years mountain walking experience and previous experience of extended wilderness camping. Winter skills, such as the use of an ice-axe and crampons, are not always necessary and you don't have to have these in advance of the expedition. However we will need to carry an ice-axe and crampons on the mountain. John Biggar and ANDES have run over twenty-five successful Aconcagua trips since 1995. In the past many of these have sold out, including in 2015 and 2016, so book soon for the next one if you want to be sure of a place. Before going to Aconcagua this expedition will make a short trip to the beautiful Cordon del Plata. 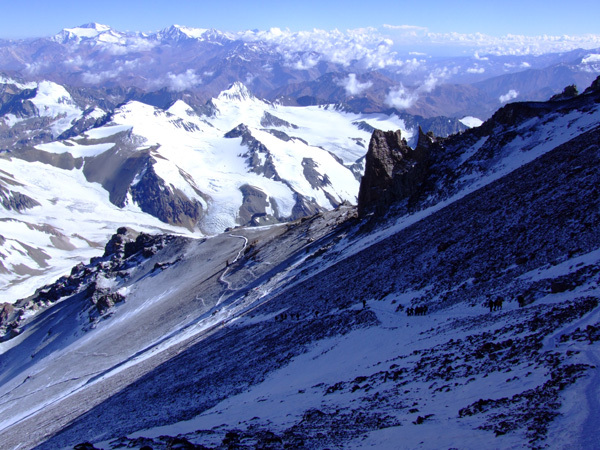 We'll climb some of the smaller peaks in this range (up to 4500-5000m) as training peaks for the ascent of Aconcagua. This short trip is also a great chance to get familiar with the climate and learn about high altitude camping. Approaching Aconcagua from the east, January 2008. NOTE - Why our Aconcagua trips are good. 1. We visit another mountain area first. This makes your expedition more interesting and increases your acclimatisation. 2. We travel by the more scenic but longer and more costly Vacas valley route. Our expeditions are 24 days long. 3. Our maximum guide to client ratio on summit day is 1:3 and in practice it is often only 1:2. This makes a big difference to your chance of summit success. 4. This trip will be guided by John Biggar (barring exceptional circumstances). John has summitted Aconcagua 8 times and of 29 clients who got to base camp he has reached the summit with 18. The average success rate on the mountain is more like 20%. Beneath the Polish Glacier on Aconcagua. Please read our warning on altitude before booking this expedition to high altitude. We always have time to see some of the city of Mendoza during the course of the expedition. Mendoza is the centre of Argentina's wine industry. It is one of Argentina's most beautiful and prosperous cities, with many tree lined avenues, beautiful tiled plazas and a good choice of steak restaurants and pavement cafes. The short time spent in Mendoza is a highlight for nearly all of our customers, perhaps because the temperature can reach 35ºC in January! Depending on flight schedules we may have part of a day in either Santiago, the Chilean capital or Buenos Aires, the Argentine capital. We can also arrange a one or two night extension for any clients who want to be sure to see either of these capital cities. 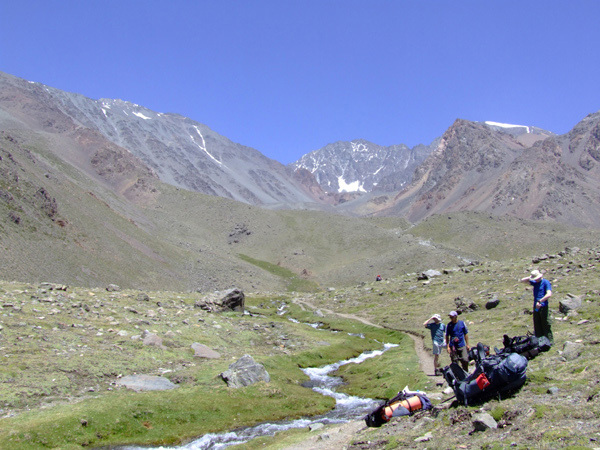 Before going to Aconcagua we spend four nights in the Cordon del Plata, a range of lower peaks nearer to Mendoza. This mini expedition is a good chance to get to know each other, get a feel for the conditions and get some acclimatisation before the big trip into Aconcagua. We drive to the Vallecitos ski resort at 3000m then walk up into the mountains usually camping at about 3300-3500m. If expedition members are feeling fit and well acclimatised there will be a chance to climb one of the many smaller peaks in the range such as Pico Franke 4850m. Lomas Amarillas and Vallecitos seen from just below camp in the Cordon del Plata. The climate at altitude in this part of the Andes is cold, windy and extremely dry. 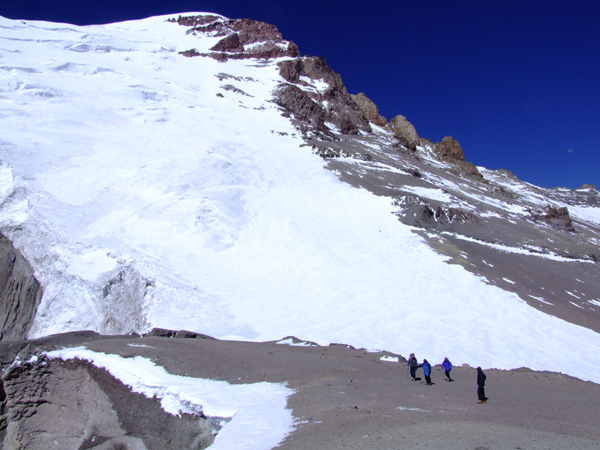 High on Aconcagua temperatures can fall to -20ºC at night. During the day it can feel warm in the strong sun, but it can also be bitterly cold and windy, especially on summit day. Temperatures during the approach trek in the Vacas and Relinchos valley are usually a pleasant 25-30ºC during the day, but cool at night. It should be dry most of the time we are there, though there is a chance of a snow storm in the mountains. What we offer is different from the package ascents of the normal route offered by most other companies. Our expeditions are 24 days long, giving you more chance to acclimatise and therefore more chance of reaching the summit. The extra 2 or 3 days we include (compared to most companies) can make a huge difference to your chances of success. Our ascents are more 'alpine' in style. We get some acclimatisation with our short trip to the Cordon del Plata, then climb Aconcagua making steady progress upwards with minimal load carrying. 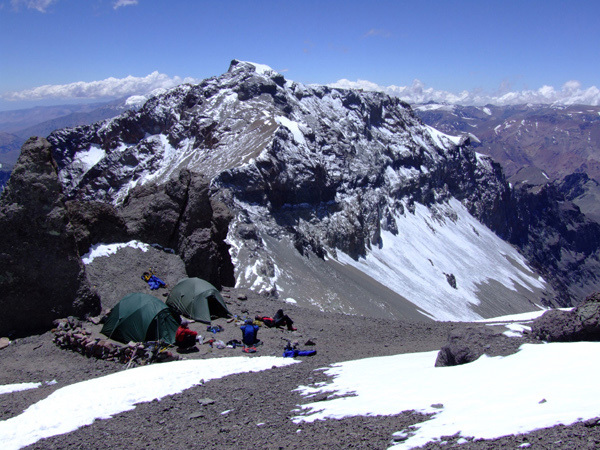 Many expeditions still use "siege" tactics on Aconcagua, which involves a lot of time sitting at an unpleasant base camp, then repeated ascending and descending on the same route to load carry. We believe our approach is not only better but also much more interesting. In the past our trips have had good summit success rates, often better than other teams on the mountain at the same time. Our party will be small, with a maximum of three clients plus leader. We use mules to help us transport extra food and climbing gear to base camp (and rubbish back out) but otherwise we will be a small group on the mountain. This lightweight approach has less impact on sensitive mountain areas. We have a better client to guide ratio than many competitors, which dramatically improves your chances of making it to the summit. Ascents to over 6000m require considerable fitness. Good hillwalking/mountaineering fitness and stamina is very important, but for high altitude expeditions clients also need good cardiopulmonary (heart and lung) fitness. This can only be maintained by a program of intensive exercise such as running, circuit training, squash or cycling. This should be done in small doses (e.g. half an hour every other day) over a period of at least three months before the expedition. If you don't do this sort of exercise you are unlikely to get to the top. The eastern route on Aconcagua is on the whole an easy ascent route with few difficulties, suitable for those with some years of winter and/or Alpine walking experience. Customers should be prepared for cold nights whilst camping and be prepared for very windy and dusty weather at times in the mountains. Customers must be able to carry their share of expedition equipment on their back above base camp. Weights carried will be up to 20kg. As we'll be a long way from the nearest supermarket we will have to put up with tinned and/or freeze-dried food in our diet during our time on the mountain. All customers are expected to assist occasionally with the routine work of this type of expedition; pitching tents, cooking and washing up. Standing in the sun at 6500m after five long cold hours in the darkness, 2011 expedition. All clients must be insured for medical costs and repatriation. We recommend having insurance for cancellation, baggage and personal liability as well. If you would like advice on insurance please ask. Vaccinations for tetanus, typhoid and polio are recommended. Argentina is very safe and relaxing to travel in; theft and muggings are almost certainly less likely than they are in many European cities. This is an adventurous trip and all clients taking part in this itinerary will be exposed to hazards not found in everyday life. While we take all reasonable precautions to reduce risk it is neither possible nor desirable to completely eliminate these additional risks. Some of these hazards carry the risk of serious injury or death. It is important that you understand the risks involved before signing our booking form. We have identified the following areas as the principal additional risks of this itinerary. This is not a fully inclusive list - please ask if you would like to see a more detailed risk assessment of this itinerary before booking. Driving, hotels and general safety : In Argentina driving, fire safety standards and general safety standards are not as high as in Europe. Remoteness : You will be camping in a remote area for an extended period and therefore obtaining medical assistance for any problem will be a slow process. 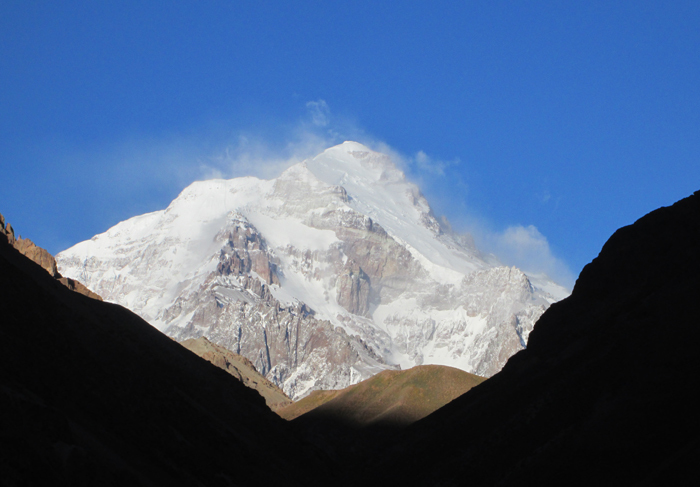 Weather : Aconcagua is occasionally affected by severe and sometimes dangerous storms. Forecasts are not so reliable. It can be extremely cold and windy on summit days, and there is a significant frostbite risk. Mountain Hazards : In certain places you may be subjected to a slight risk of rock slips. There are river crossings on this itinerary which could become very serious in wet weather. In stormy weather there may be a slight risk from avalanches higher on the mountain. A warm high camp on Aconcagua at 5900m in February 2009..... and in contrast below ....the mountain in cold and stormy conditions in January 2016. Our expeditions are designed to be smaller and more flexible than the rigidly organised expeditions of large companies. The expedition will be co-ordinated, organised and led by us, but we'll consult and involve the expedition members when planning the day-to-day details of the trip. Please note however that the leaders decision is final where the safety of the group or any member is in jeopardy; for example where retreat or diversion is necessary due to illness or bad weather. The group size will be just three customers plus leader so you can be sure of personal attention and a very good guiding ratio. This trip will be guided by John Biggar (barring exceptional circumstances). John has summitted Aconcagua 8 times and of 29 clients who got to base camp he has reached the summit with 18. Five of those who did not summit with John were on one single expedition where the weather was shocking and other groups on the mountain were left with frostbite injuries. This 60% success rate contrasts with the average success rate on the mountain, which is about 20%. 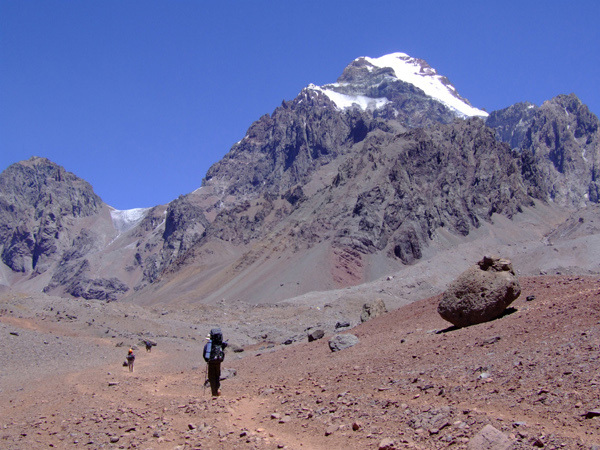 Aconcagua is a popular choice as a first 6000m peak, or the "next step" after Kilimanjaro. However it can be a tough trip if you have not climbed in the Andes or Himalayas before. Although the ascent is just a "walk" for experienced mountaineers every year we have seen less experienced groups on the peak struggle with the combination of difficult terrain, seriously cold conditions and the extreme altitude. Aconcagua is physically and psychologically the toughest expedition we run because of the frequent bad weather and the extended period of wilderness camping. 2. Recent experience of extended wilderness camping and/or camping in cold winter conditions. 4. Good skills walking on scree and loose ground. If you have none of these previous experiences you are very unlikely to make it to the summit and you should not book any Aconcagua trip until you gain more experience. 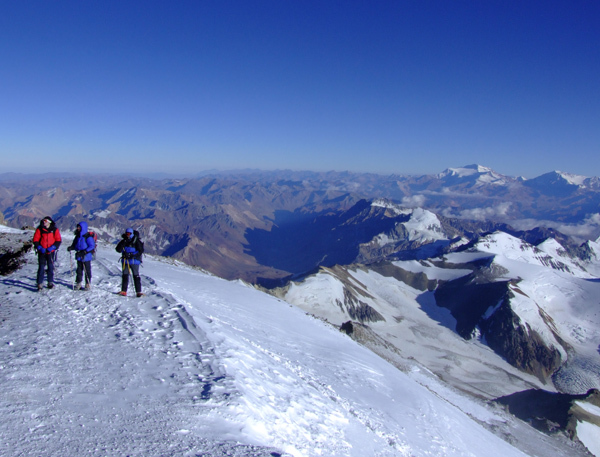 Our expeditions are no more demanding than others, Aconcagua is just a very tough mountain.